Welcome to the first installment in a series of four essays focused on Katharine Kerr's Deverry Cycle. This is similar to the work I'm doing on Kurtz's Deryni novels, except this is my first time reading / experiencing Deverry rather than revisiting my old Deryni friends. To be completely upfront and honest about this, we shouldn't expect to see the Act Two essay until this time next year at the earliest. It's possible, but doubtful that I'll have read the four books of the Westlands Saga by then. It should also be noted that because I'm talking about and around the first four Deverry novels together, I will mention how events from the first book resolve in the fourth. "It was all a very long time ago," Jill said. "And how many lives have I lived since then?" "So - you know the truth, do you?" "I do." Jill turned from the fire to face him. "How many lives has it been?" "In time you'll remember them all. Let's just say that it was too many, and too many years all told." 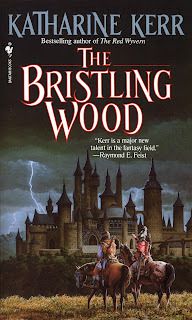 To greatly simplify a powerfully complicated series of relationships and events, the inciting incident of Katharine Kerr's novel Daggerspell is this: Galrion (a prince) is betrothed to Brangwen. He loves her and she loves him. The only problem that Galrion sees is that what he really wants to do in life is study dwoemer (let's call it magic, shall we?). Dwoemer is his destiny, so even though Brangwen dearly loves Galrion (and has some potential for learning the dwoemer herself), Galrion chooses the dwoemer over Brangwen and is exiled by the King (also, his father). But, before he leaves for exile, Galrion sets things up so that Brangwen can marry his best friend, Blaen. Blaen also loves Brangwen, who is now depressed and mourning Galrion. While Blaen struggles to convince Brangwen to love him, Brangwen's brother, Gerraent is trying to get his sister into bed with him and eventually succeeds. More depression and suicidal discussion is overwhelming Brangwen. Gerraent, it should be noted hates Galrion, but is also friends with Blaen. It's a complicated small town circle of friendship and obsession. 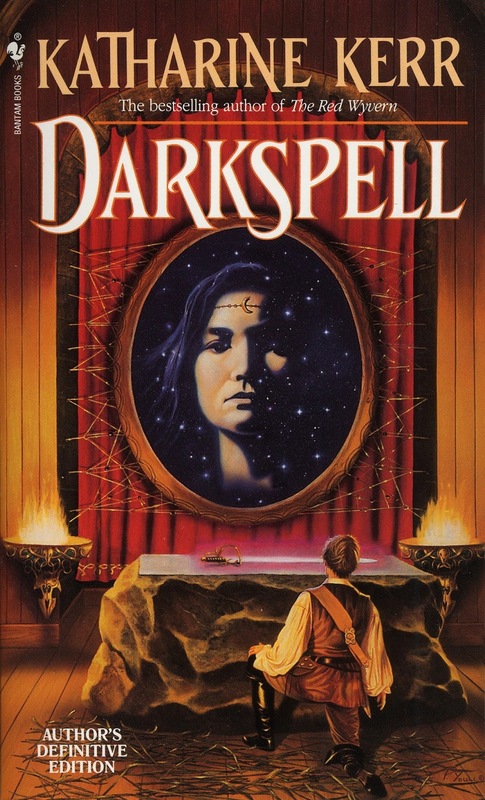 This is some dark and gloomy stuff, but it matters because what happens here sets up four hundred years of character and soul development for the rest of the series (or, at the very least, for the first four books). Here's what happens next: Blaen and Gerreant are killed, Brangwen commits suicide, and the exiled Galrion, now known as Nevyn (meaning of name: no one). vows that he will not rest until he has made this right somehow. The gods listen. The gods grant him this. Nevyn will age (to a point), but he won't die until he untangles the wyrd (let's call it fate) for everyone involved in this sad, sad mess that Nevyn ultimately caused because he was selfish and both over and under thought the situation and wouldn't take Brangwen with him into his dwoemer studying exile. The concept of a character's wyrd is connected to the idea of the Celtic knot. Here, the concept of wyrd is that of an individual's fate. But, we're not talking about "fate" in the sense of an uncontrollable or unchangeable destiny. Brangwen's wyrd isn't to commit suicide on the banks of a river after a series of events which would have left Shakespeare appalled, but it happened anyway. Brangwen was meant for something different, for something better. That's what the wyrd is in the Deverry Cycle, someone's fate, their wyrd, is about an individual truly becoming who they were meant to be. It is about the growth of a soul. 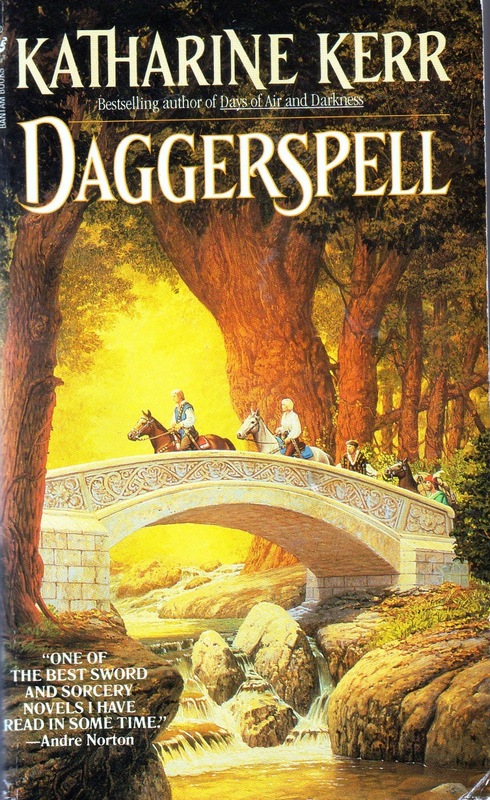 The shape of the series is set in Daggerspell, but we're not really just talking about Daggerspell. Katharine Kerr's Deverry Cycle is divided into four Acts which complete the larger Cycle of 15 volumes. For the sake of this article, and simply because I have only read the first four books of the Deverry Cycle, we're going to limit ourselves to Act One: Deverry. 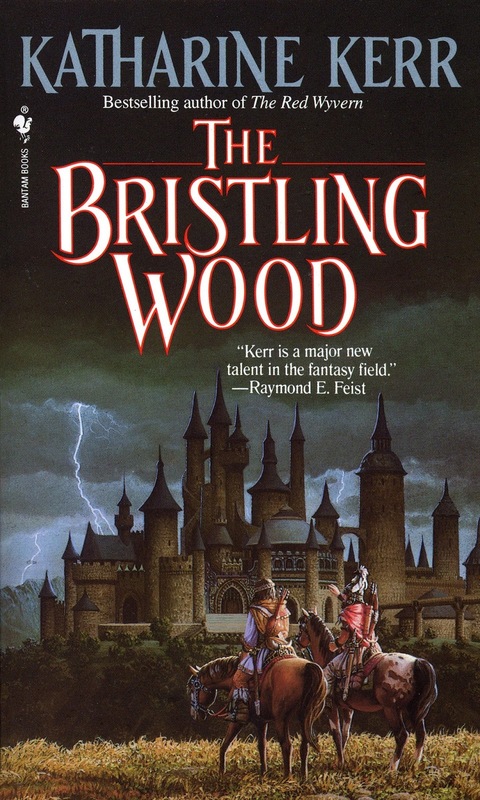 Having finished The Dragon Revenant, the fourth of the volumes comprising the First Act, I can tell you that knowing there are 11 more novels seems baffling / superfluous because this seems to have so perfectly wrapped up the story began in Daggerspell. There are so many more lives left unexplored and a chart of the different aspects of the characters that shows so much while telling so little, but this feels complete. It feels like an ending (which it is, the ending of the first Act - of four). Daggerspell, by virtue of being the first novel written in the series, serves as an introduction. We first get to meet the characters of Nevyn (Galrion), Jill (Brangwen), Rhodry (Blaen), and Cullyn (Gerraent), then we step back in time some four hundred years to meet their much earlier incarnations and it is in that earlier time that all of that nastiness I already wrote about began. 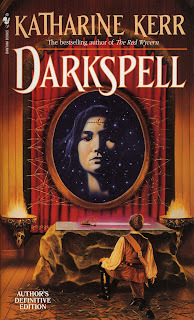 Throughout the Daggerspell, Darkspell, and The Bristling Wood, Katharine Kerr bounces the reader between what we, for now, should consider the "present" era of the Deverry Cycle - the years surrounding 1060 - and several other eras. Though I would argue that right now the actual years are not terribly important, the Galrion / Brangwen was set back in 643. Daggerspell gives us an era set 50 years after and we can see how the reborn souls of Brangwen, Blaen, and Gerraent have emphatically not dealt with what happened in that previous lifetime. This is a series of so many opportunities for the souls of characters to get set onto the right path, the path they always should have been on if Galrion didn't help push them off of it. Remember the opening quote to this essay, of Nevyn telling Jill that it had been too many lives and too many years to get the two of them to the point that they might finally untangle their wyrd and set it straight. It is how Kerr weaves these different eras together that is the true strength of the Deverry Cycle so far. The anger and disappointment and broken wrecks of soul that were left at the end of 643 go through a number of incarnations that ever so gradually reshape, and there is a strong sense that it would be oh so easy for characters like Gerraent / Tannyc to never become the man that Cullyn is four hundred years later. It is nothing so trite as to say "time heals", because while that can be true, it can be equally true that time allows wounds to fester. It is through time, but also Nevyn working to try to nudge these men and women on the right path, that truly allows us to see the changes. It's all one story, but at the same time - it isn't. Each era is very much its own story with distinct motivations and problems. But it builds the larger story into a cohesive whole. The word "nudge" is important here when we're talking about Nevyn because what started all of this was that when he was known as Galrion, Nevyn denied Brangwen the choice to set her own path and thus chose for her, for Blaen, and for Gerraent. With that now restricted set of options, each of them made their own individual choices that also led their souls away from their respective wyrd. So Nevyn's wyrd is to help these three find their own wyrd and let them choose. Nevyn can't force Jill to choose to study the dwoemer, even though it is her wyrd to do so, she has to freely choose what she was not permitted to do four hundred years prior. One of the things that has stuck with me from the first four volumes of the Deverry Cycle is the importance of choice, or, more specifically, the ability to choose. 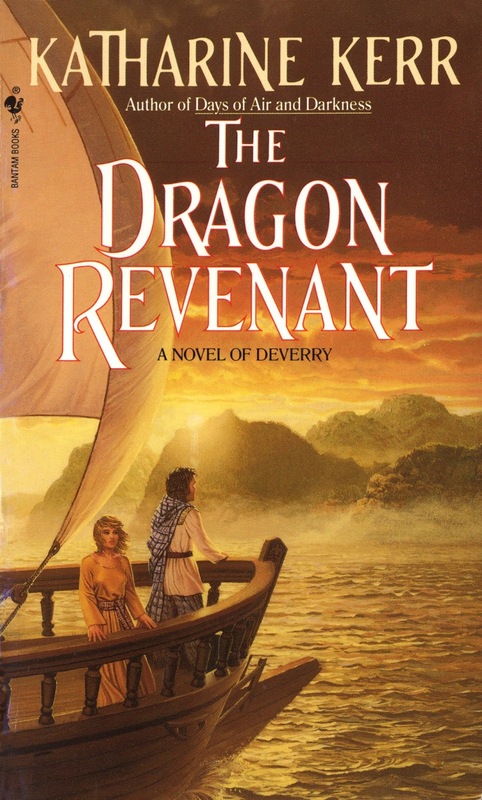 When we get to The Dragon Revenant, Kerr changes how she presents the novel. Rather than telling the story from multiple timelines, this is the first time the story is only told from just one: the present. Kerr writes of Rhodry, Jill, and Nevyn. At this point, Rhodry has been taken captive, sold into slavery, and has had his memory wiped by magic and torture. We're glossing over three books worth of material to get us to this point, but the single era storytelling of The Dragon Revenant is slightly jarring after the first three volumes. We no longer get that overall progression of the soul and see how Brangwen of 643 shapes Lyssa of 696 shapes Gweniver of 773 shapes Jill of 1060, or how these souls are products both of their history as well as the situations into which they are born. What we do get is a deep examination of how Rhodry's ability to choose the path for his life has been altered / eliminated because, at this point, Rhodry doesn't even know who he is or where he came from. Throughout the novel he gets glimpses, glimmers, of who he was. He knows that he is not a slave and should not be a slave. Meanwhile, through her journey to recover Rhodry, Jill (Brangwen) is learning about what it is that she wants / needs in her life. For three books she thought it was Rhodry, but she is coming to realize that it is more important to her that she studies dwoemer than it is for her to be Rhodry's woman, whether or not that role comes with a crown. But, it is that singular narrative with which, for the first half of the book, I struggled to connect and engage. The characters of the "present" narrative have often felt more immediate than those of the various "past" narratives, but somehow that was lost when the entire novel is focused on this one time frame. "Brangwen?" he said at last. "Do you forgive me?" 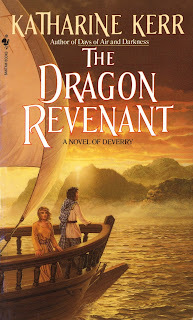 The second half of The Dragon Revenant, however, was deeply moving because it is the culmination of the previous three and a half books and finally resolves all of those issues which began in Daggerspell. It is also the point, as mentioned earlier, that I wonder where Kerr goes in the subsequent eleven books because the story feels done. Finished. Complete. Full circle and full stop. Instead, this is simply the end of the first Act. There are three more to complete the full Deverry Cycle. As a side note, I'm curious as to who the narrator of the Deverry Cycle is and if it truly matters. There are comments sprinkled throughout the series like this one in The Dragon Revenant, "In Jill and Nevyn's time, the town was only a tiny farming village." This would suggest that much later, it isn't a tiny farming village anymore. Kate Elliott points out, in her Daggerspell re-read with Aidan Moher, that "an entire little drama plays out quite amusingly tucked into the comments at the end of each volume's [pronunciation] guide" She further posits that this narrator, presumably the same one who wrote the pronunciation guide, is writing historical fiction based on her world's past. I'm not sure if I completely like that idea, but it's something to consider. Someone is telling this story. Postscript: This essay was written prior to Katharine Kerr's announcement that she had sold a new Deverry novel to HarperCollins UK. The expected publication date is late 2017 and she does not yet have a US publisher for the novel. Subsequent essays in this series, in particular the last one, will make note of the forthcoming volume. How this novel will fit in to the overall structure of the series, given that 2009's The Silver Mage was intended to be the final novel, remains to be seen.